HB Reavis’s Stanislav Frnka discusses the difference between developing in London and Warsaw, and why there is still space for growth in the Polish capital’s office market. Poland Today caught up with Stanislav Frnka just before he headed off for some R&R in Liptov, a valley renowned for its geothermal energy located between the low and high Tatras in his native Slovakia. At the age of 10 he dreamed of joining the police so he could work with sniffer dogs, but instead he joined HB Reavis after a degree in engineering from the City University of Seattle in Trencin, Slovakia. He is now CEO of the company in Poland, establishing it as one of the most successful developers in Warsaw. HB Reavis is active only in offices in Poland at present, and in other countries you also develop retail and logistics centres. What about the hotel market? We’re in discussion with several hotel chains about potential for hotels in some of our schemes. As far as I’m aware, you’re the only central European developer active in the London Market. What lessons has HB Reavis learnt from your London projects? It’s a different culture, a different set up. In the Visegrad 4 countries [of Poland, the Czech Republic, Hungary and Slovakia – ed.] we have the same operation model – we do the construction ourselves, and the architects have to follow what we want. In London it’s different and we’ve had to adjust, just like we had to adjust when we first came to Warsaw. The cycles are faster than in CE, with more opportunities to buy – and of course the GBP has depreciated. There are more companies interested in a plot, seven eight, or even more. In Warsaw there are less big players so it’s usually only two or three. It’s all valuable experience. We were positively surprised about the divestment of our 33 Central project (to Wells Fargo). We built on spec, and first they wanted to lease, then to buy – and they did. How did a Central European development company with no previous track record in London find such excellent plots? You have to sniff around. Tomas Jurdak (CEO of HB Reavis UK) was there. There was a tender (for 33 Central) and we were the lucky winner. As a company active in the United Kingdom, how do you see Brexit effecting the Polish real estate market? I don’t see any immediate effects. Some investors try to play the Brexit card, trying to get the price down, but when you get into the details – there are no arguments why they should wait, why they should get a discount. Investors are cautious, but what we started before Brexit we are continuing now. There’s no difference. 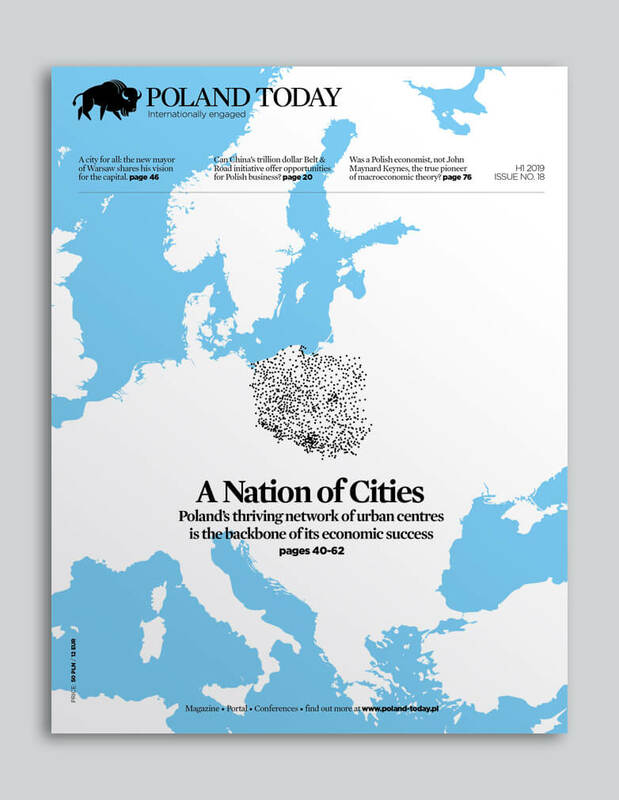 Will more businesses come to Poland? There are speculative discussions, but no negotiations have started. Maybe there’s a longer term effect on banks with the clearing issue, euro vs the pound. There could be losses or gains, so there could be an effect on banks. If Brexit is not a big issue for the Polish real estate market at present, what are the big issues facing the market? Big issues? I can’t think of any. Everything is going so well – something has to go wrong! I don’t like the amount of money being pumped into the system – it’s not good for risk assessment. There’s funding from the EU, funding for start-ups. If you lose the money, there are no consequences. It’s not healthy. If you’re getting money for nothing, what’s your lesson if you go bankrupt? You need to create long-term profit. I have heard that the new generation is unwilling to work in BPOs and SSE s. In Warsaw the new outsourcing centres are more advanced, with more advanced services. For example, IT back offices. Its feeling good but it’s not ready yet. It’s a project with great influence on Warsaw’s urban landscape. We hope to be able to share our idea with the people of Warsaw soon. Can the Warsaw office market take what will be a very large office building? Let me answer that by going back in time a bit. In 2007/2008, when HB Reavis was looking at Warsaw, the perception of Poland by Slovak people was not so positive. It was perceived as grey, not very attractive for tourists. It was unusual compared to other European capitals, so why should we go there? When I first came I saw there was a lot of space for development. A lot of space. If you compare it to Vienna, there’s something like ten million sqm of space for a population of around two million. Warsaw had less than four million sqm. Now, when West Station 1 is handed to the market, it will pop to just over five million sqm. So you see that there is still a lot of potential. The worry is short-term thinking, or simply people are used to a lower vacancy rate. This is a result of “easy” money with developers building on spec and now struggling with empty space. You can also compare Warsaw with other cities in another way. I took part in a discussion called “Warsaw 2030”, where expats were asked what they see in the city and what they expect from it. A guy from Paris who moved here several years ago said the quality of life is better in Warsaw than in Paris! Warsaw is doing really well. The way I know, Polish and Eastern European people, we’re hungry for success. We want to get to the same level as in the West. This is the main motivation of young people. This is why, business-wise, it’s worth coming here. What other sectors are you looking at in Poland? Logistics no – there are too many big players here and the margins are low. We’d like to go into retail, but not residential. We’re not active outside Warsaw so far, but we’re always discussing different sectors, different markets. We would like to grow in Poland – there’s a limit to how much you can do in Warsaw.